If you are in the highly competitive BFSI sector, serving millions of customers, then speed to market is extremely important to you. Being agile enough to launch new micro-services on the fly is the order of the day, which is why we believe that “App-less Mobility” is the future. A couple of weeks back, we presented our App-less mobility solution at the Economic Times BFSI Innotribe event, that can not only transform your business process but also customer experience and ultimately your business results. Let’s begin with a hypothetical situation from the banking sector. The sales team has landed a large account with about a 1000 employees and it is time to on-board these 1000 new customers onto the systems. How easy is this today? You will probably need a small army of agents to fill up forms, obtain documents, affix photographs, obtain the required signatures etc. It is incredibly time consuming, costly and filled with errors. And yet, the same process is followed, customer after customer. 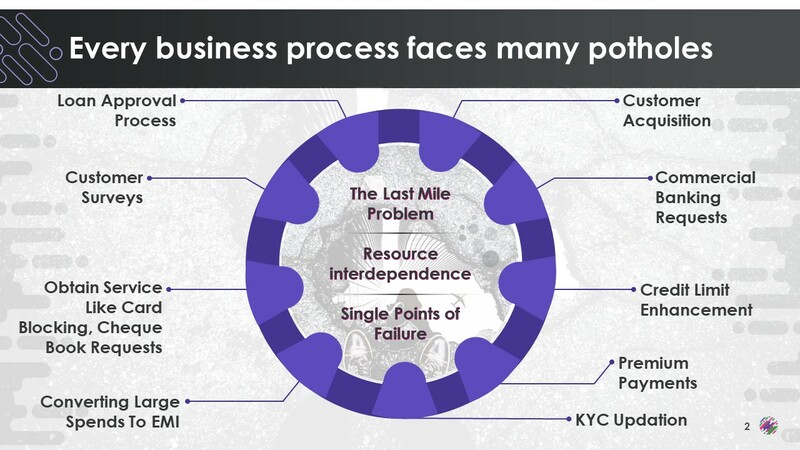 Whether in a B2B or B2C scenario, the efforts, costs and poor quality are unacceptable. And this is not restricted to just the customer on-boarding process. It happens all across the business. In process after process, you are experiencing delays and highly resource intensive execution. In other words, business are driving on roads that are filled with potholes that slow you down. Second, in most enterprise systems, computing resources are shared across several process. Therefore, there is heavy dependency for key process on other processes that have no relationship with each other. Final, there is a single point of failure. If the central system is down, then ALL systems are down. But why do these potholes exist really? 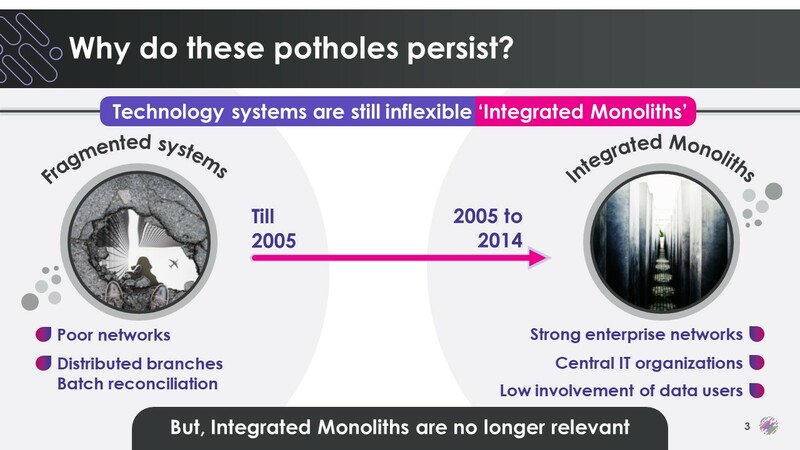 These potholes exist, as technology systems are still integrated monoliths. If we look back, until about 2005, IT systems were still fragmented. This was primarily due to unreliable networks. Remember branch level systems that were reconciled with central systems every hour or every day in batch mode? But as networks became reliable (2005 till 2014), IT systems became centralized. This had its obvious benefits of efficiency, centralized control etc. But this made the core systems very rigid. You all experience what that means. And address Constant cost pressures, every month. And eliminate the need for human intermediaries. But in order to avoid creating new potholes, these solutions must operate independent of core systems and be accessible outside the mobile app. 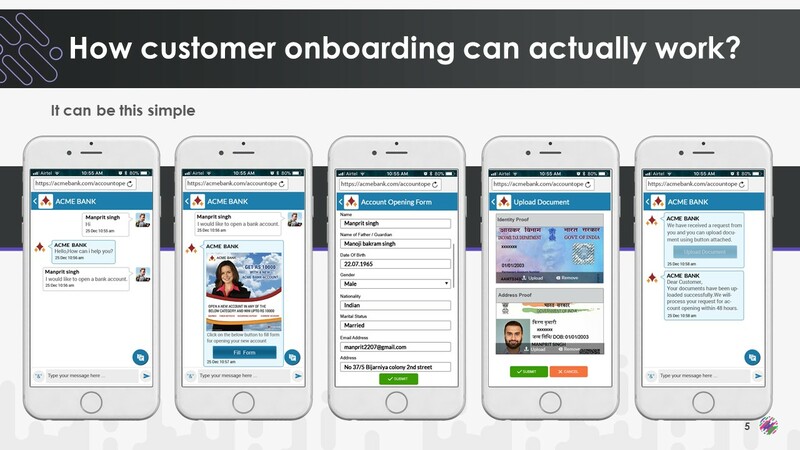 Here is an example of how customer on-boarding can actually work. 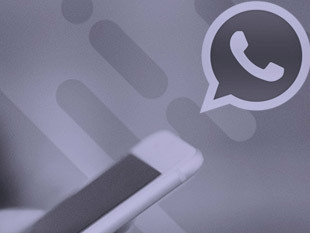 It can just be as simple as having a conversation in a chat-like app. And this bridge is App-less Mobility. With app-less mobility, you can launch automated microservices that can transform your business. Microservices, can help you deliver any service you wish to users, as they connect to your core applications through APIs without sharing the resources of core systems. 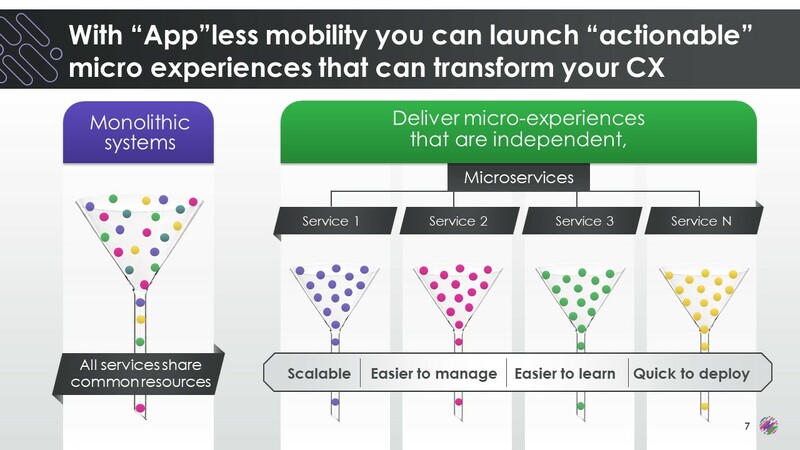 With appless mobility, you can launch automated microservices that can transform your business. Microservices, can help you deliver any service you wish to users, as they connect to your core applications through APIs without sharing the resources of core systems. Launching micro-services with Karix is really easy. 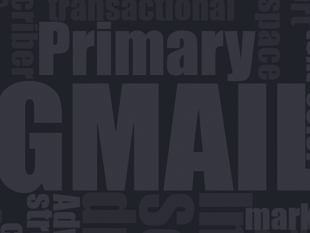 The core is the BPM engine that allows you to organize and automate any business process that you may like. So what can you do with micro-services? With App-less Micro-Services there is no need for your business to slow down. 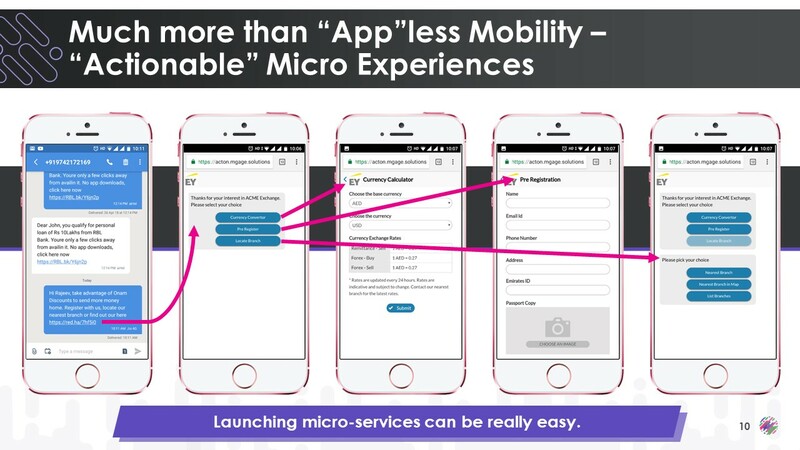 In short, with App-less mobility microservices, there are no potholes for your business. 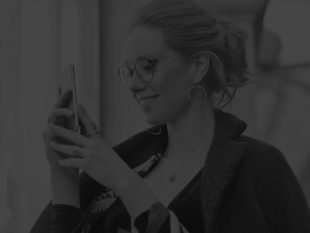 So, if you want to know how App-less Mobility and micro services can transform your business, write to us at marketing@karix.com and ask for a complimentary PoC.